Below, we’re outlining the best 25 medical imaging software for Linux enthusiasts who want to use their favorite distro when working with such imaging. Our experts have selected an impressive number of Linux DICOM viewers to empower you opening these files while they also brief other medical imaging software for Linux which comes into play at times. A compelling cross-platform GTK+ tool, this medical imaging software for Linux allows medical professionals to view, register, and analyze complex medical documents at ease. It’s typically hailed as one of the best Linux DICOM viewers due to its intuitive GUI which features a long list of convenient features. Some of these features include the ability to load multiple datasets, anisotropic filtering, and independently thresholding datasets. A handy GUI interface that lets the user perform a wide array of essential tasks quite efficiently. The powerful anisotropic filtering wizard can use Gaussian, 1D Median, and 3D Median filters. Users can crop and clear regions of their datasets easily with Amide and export studies as XML files. This medical imaging software enables users to draw 3-D ROI’s directly on the images. DicomBrowser is one of the most powerful Linux DICOM viewers that you can get your hands on. This compelling medical imaging software for Linux is built on top of JAVA and offers quite some features. Users can inspect the metadata of their DICOM files very quickly with this modern-day medical software. Developed at the Washington University by the Neuroinformatics Research Group, DicomBrowser entirely lives up to the hypes around it. This medical imaging software can load thousands of relevant medical images concurrently. Users can quickly send the modified files over the network to a predefined DICOM C-STORE service class provider like PACS or XNAT. The opensource nature of the software enables developers to adopt and customize it according to their own needs. DicomBrowser also comes with a handy command line interface. 3D Slicer is one of the best platforms for medical professionals to analyze their medical documents conveniently. The main features of this medical imaging software for Linux include medical image informatics, powerful image processing abilities, and three-dimensional visualization of medical data. This is among those influential Linux DICOM viewers that not only enable users to view, and analyze medical documents but also offers advanced image analysis algorithms for diffusion tensor imaging. 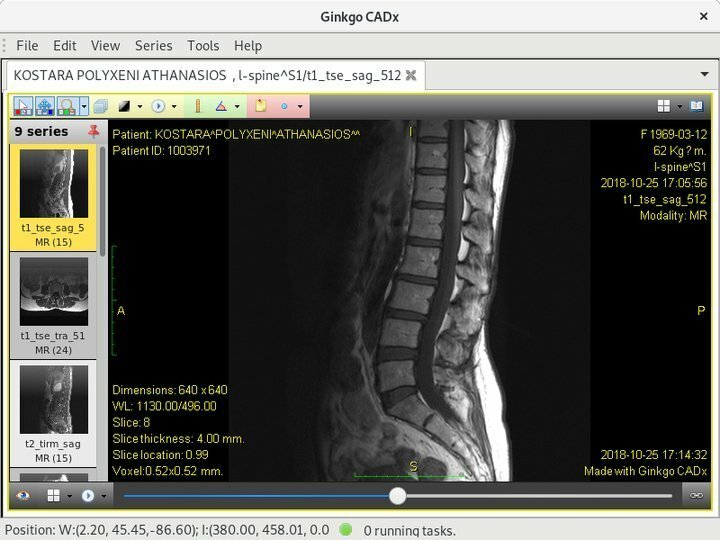 The sophisticated visualization capabilities of this Linux medical imaging software leverages VTK, a GUI library which provides an easy to use interface to OpenGL. Users can capture scene snapshots to visualize all the parameters of a specific scene. It allows for the automatic segmentation of medical data. 3D Slicer can track devices used for image-guided procedures. Mango (Multi-image Analysis GUI) is a mighty powerful medical imaging software for Linux which comes pre-packaged with powerful image analytics tools for medical professionals. The minimal yet intuitive user interface of Mango helps users to navigate even large volumes of images without any hindrance. Upon starting, the software shows the menu for opening images, setting options, getting help, and selecting windows among others. It can analyze a wide range of medical documents including but not limited to DICOM, MINC, NIFTI and NIFTI2 formats. The core software is developed with JAVA but supports both JAVA and Python API developments. This medical imaging software is exceptionally customizable, and users can easily create personalized filters, color tables, file formats, and atlases. It supports kernel and rank filtering, ROI calculators, Time-series analysis, and Semi-automatic image coregistration among others. 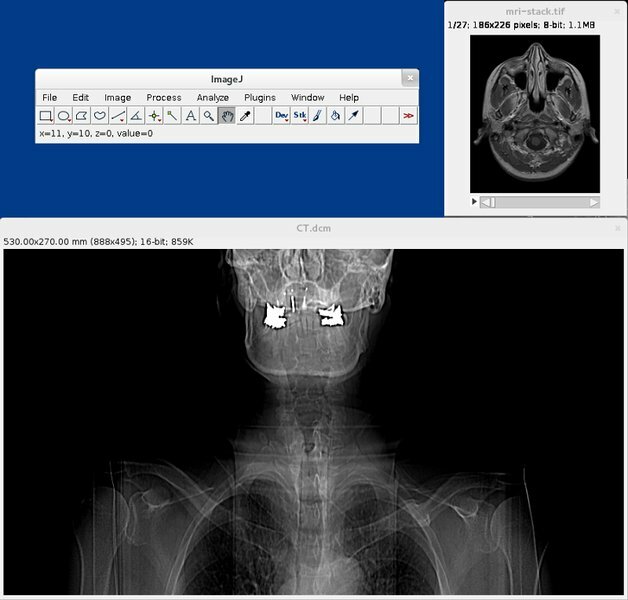 One of the best medical imaging software for Linux, Ginkgo CADx is among those striking Linux DICOM viewers who can also act as a DICOMizer. This powerful medical image processing platform provides an out of the box solution for viewing and analyzing essential medical documents like MRIs and X-Rays. Ginkgo CADx also features quite a list of advanced capabilities matched by only a few. This Linux medical imaging software can convert a range of different file formats(PNG, JPEG, BMP, PDF, TIFF) directly into DICOM files. Users can easily create and personalize their profiles for customizing the interface. It supports a substantial list of modalities including but not limited to Neurological, Dermatological, Ophthalmological, and Ultrasound. Thanks to its opensource nature, developers or enthusiasts can easily extend the functionality of this software through custom extensions. It’s arguably one of the most productive medical imaging software for Linux used in converting medical documents across a broader range of formats by professionals. This opensource library is useful for quite several purposes. Among them, image conversions and reconstruction of nuclear medical images are the most prominent. XMedCon also allows users to read unsupported files even without any conversions. This medical imaging software is especially suited to professionals who are new to the Linux ecosystem. The prepackaged command line interface enables advanced operations like batch image conversion and automated scripts. The built-in API lets developers extend this tool to support even non-supported image formats. Advanced users can easily hack the tool with Acr/Nema tags. It can quickly reslice images into multiple views such as transverse, sagittal or coronal view. If you’re running an older Linux machine and are looking for lightweight yet flexible Linux DICOM viewers, then 3DimViewer seems to be a pretty decent choice for you. This opensource 3D medical imaging software aims to provide a powerful medical image viewer tool, and we are seriously pleased seeing the result. Thes source is up for grab if you’re looking forward to tailoring this tool according to your requirements. 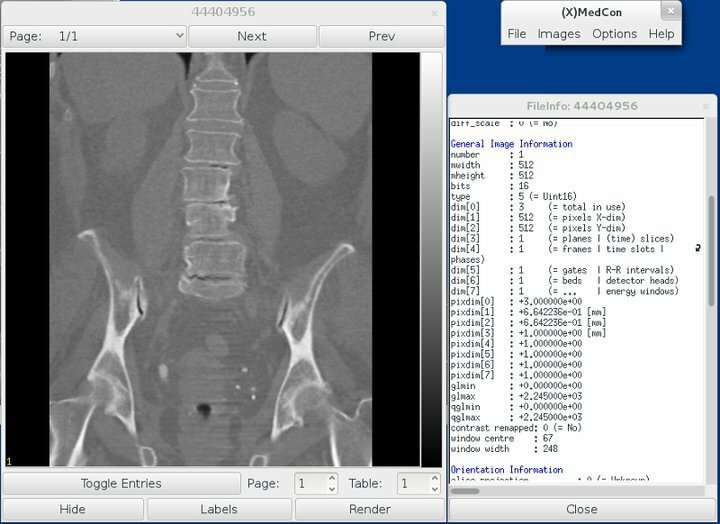 This powerful DICOM file viewer is written using C++, thus offering a performance matched by only a few others. 3DimViewer allows for both a multiplanar and orthogonal view of your medical images. You can make the software even faster by utilizing the shaders of NVidia and AMD graphic cards for volume rendering. It also implements a powerful tissue segmentation feature based on thresholding. 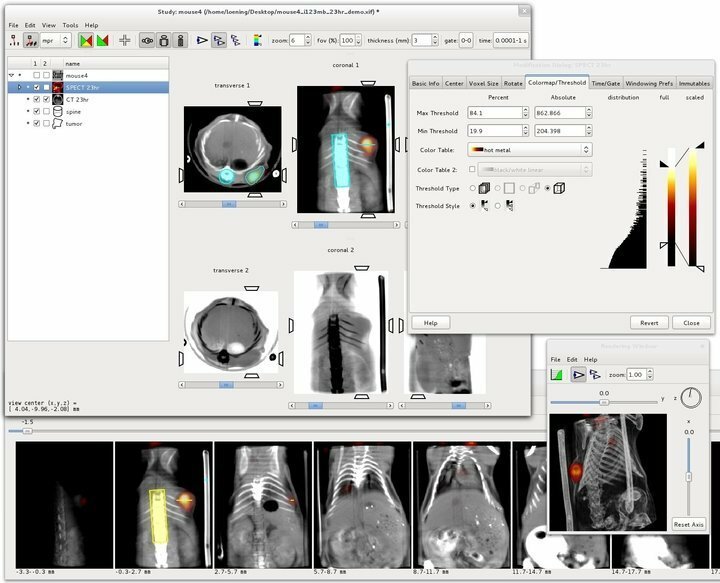 Weasis is modern-day medical imaging software for Linux based on Cloud technology. It comes with a highly modularized architecture that enables very high-quality renderings with top performance. Although a standalone desktop version is available, healthcare professionals tend to opt with the web version due to its available offerings. It’s arguably among those Linux DICOM viewers that empower users to view their medical documents on the go. Users can easily connect to PACs by utilizing the web portal and send and retrieve DICOM files over a network seamlessly. Weasis can be configured with a shallow memory footprint, thus proving an excellent choice for people on older systems. The handy API endpoints give developers the ability to integrate Weasis with new software or build custom plugins. Weasis can use a wide array of options when exporting DICOM files (DICOMDIR, ZIP, ISO, TIFF, JPEG, PN). If you’re looking for compelling medical imaging software that can display 3D medical images without any trouble, MRIcroGL is a suitable option for you. This opensource therapeutic tool comes with powerful features for displaying 2D and 3D medical images. If you’re using modern systems with added graphics card facilities, then this software will allow for real-time interactive rendering. MRIcroGL can display both 3D renderings and 2D slices of medical images. The clipping tool of this powerful Linux software enables users to view a 2D slice cut through a 3D rendered image. It’s among those Linux DICOM viewers that can convert DICOM files to NIfTI files directly. Users can change the appearance of the intensity-color bar for quickly finding the range of intensities. 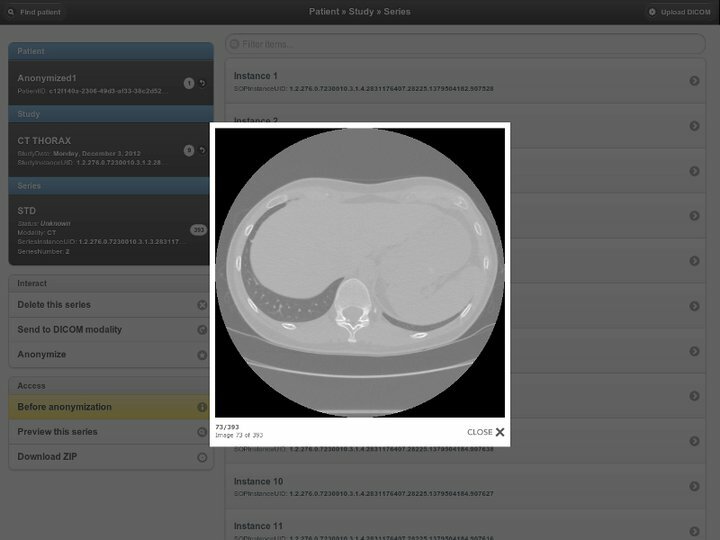 Aeskulap is arguably one of the most popular Linux DICOM viewers for medical professionals. 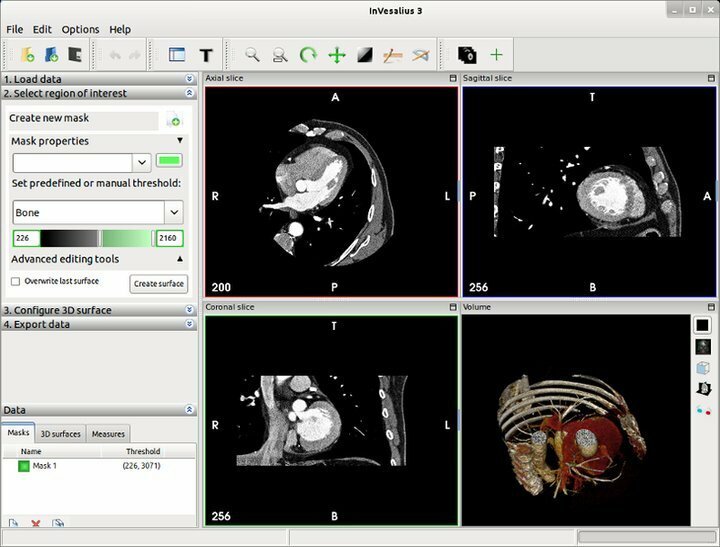 This awe-inspiring Linux medical imaging software allows the users to load a series of medical documents. On the plus side, Aeskulap can query and retrieve DICOM files over the network from PACs, which makes it extremely useful for healthcare systems. The opensource software comes with a GNU GPL license and enables developers to customize it as per requirements. Aeskulap supports a diverse set of DICOM files such as compressed (lossless, lossy), uncompressed and multiframe. The display support for Rescale or Intercept tags works exceptionally well. It can handle color images quite well, and users can define their custom window level presets also. Aeskulap allows for image manipulation in real-time and renders reference images in multiple views. SMILI(Simple Medical Imaging Library Interface) is another excellent medical imaging software for Linux machines that comes with an easy-to-use Linux DICOM viewer and library. This lightweight medical imaging library is adept at quite several useful things. Some of its features include displaying n-D images, vector images, DICOMs, anonymizing medical documents, and shape analysis. The use of several top-notch image processing algorithms results in mesmerizing performance. The tool is pronounced ‘Smiley’ in regular use. It enables the users smoothing, thresholding, and masking medical images quickly with the built-in GUI and command line interface. Being built on top of Qt, the user interface of SMILI is uniform and provides quick access to the Insight Toolkit (ITK) and Visualisation Toolkit (VTK). Professionals can view and deformation field visualization with SMILI. The dcm4che is a collection of powerful and enabling open source applications and utilities for the healthcare professionals and aims to provide a convenient mean for managing clinical image and objects. This JAVA-based medical imaging software for Linux offers a robust and flexible interface running entirely inside a web browser. The dcm4chee utility of this library is useful for managing and archiving critical medical documents. It’s mostly a library for medical image processing, rather than a standalone software on its own. dcm4che is among those Linux DICOM viewers that can store every DICOM objects to the standard Linux filesystem. It comes with powerful built-in support for Client/Server PACs model. Some of the DICOM services of this library include storage commitment, instance availability notification, output content to cd media, etc. ImageJ is a mighty powerful medical imaging software for Linux built on top of JAVA, one of the best software programming languages. It can analyze and process 8-bit, 16-bit and 32-bit medical images. It’s one of the most empowering Linux DICOM viewers that allow users to read medical images in TIFF, GIF, JPEG, BMP, and “raw” formats. The software also allows multiple images to share a single window. The multithreaded nature of ImageJ places it among the fastest medical imaging software available right now. The software is released in the public domain, meaning developers can modify and distribute this software as they like. ImageJ can analyze mean, measure area, standard deviation, min-max selection, profile plots among many others. It enables professionals to perform geometric transformation very efficiently. 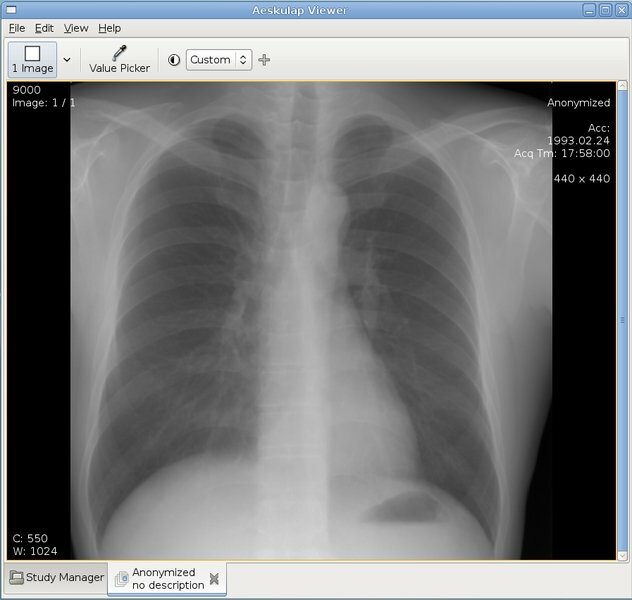 kradview is professional medical imaging software for Linux systems that allow healthcare professionals to view medical documents from X-ray, NMR and all DICOM-compatible imaging devices. It’s one of the easiest to use Linux DICOM viewers available and can render images instantly irrespective of size and dimension. This is a complete platform for medical image analysis and processing and can be used for viewing radiological images and their metadata. Using this medical imaging software for Linux is comparatively easier than everyday Linux DICOM viewers. kradview provides several levels of zoom to make sure professionals can analyze the documents quickly. It can read and edit metadata of medical images obtained from several sources pretty fast. openDICOM.NET is a cross-platform opensource DICOM viewer that provides a lightweight and easy to use file navigator for opening and viewing important medical documents easily. It comes with a built-in DICOM file browser for Mono written in C#. The opendicom-sharp utility of this powerful medical imaging software for Linux provides a handy API to DICOM. It has full support for ACR-NEMA and DICOM files right out of the box. This is among those Linux DICOM viewers that can export medical imagings directly into XML files. Users can view their images with either single or multiple frames. It also supports gray images with variable bit rates, image slide cycling, image processing with GIMP, among others. Most modern-day healthcare professionals look for robust and portable Linux DICOM viewers for many reasons. postDICOM is one of such compelling medical imaging software for Linux that’s entirely cloud-based and aims to provide a secure platform for professionals to view and analyze sensitive medical data. Patients can see their documents directly from the web and can share them with doctors. It comes with built-in support for multiple modalities including but not limited to MRI, CT, XA, PET, and others. postDICOM cloud PACs enables both medical professionals and patients to utilize this fantastic medical imaging software for Linux. It features a handy HTML5 viewer for DICOM files. If you want to run a full-fledged medical imaging software for Linux on one of your older machines, you might want to stick with lightweight Linux DICOM viewers. MatrixUser is one such lightweight yet flexible imaging software that provides more than regular performance in even low-resource systems. We found the default GUI interface to be intuitive while the image processing speed seemed to be well above the bar. The GUI interface is highly interactive and provides a smooth user experience. This is among those Linux DICOM viewers that can also convert medical documents in other formats into DICOM directly. Users can analyze their medical data directly in the Matlab. MatrixUser shines when it comes to manipulating both real and complex data matrix. NextCloud is one of the most popular and free cloud-based medical imaging software for Linux. It incorporates a rock stable user interface to make the navigation as pleasant for the users as possible. NextCloud comes with in-built support for several clients, notably both desktop and mobile. The full-fledged DICOM viewer of this med tool is comparable to the best Linux DICOM viewers quite easily. 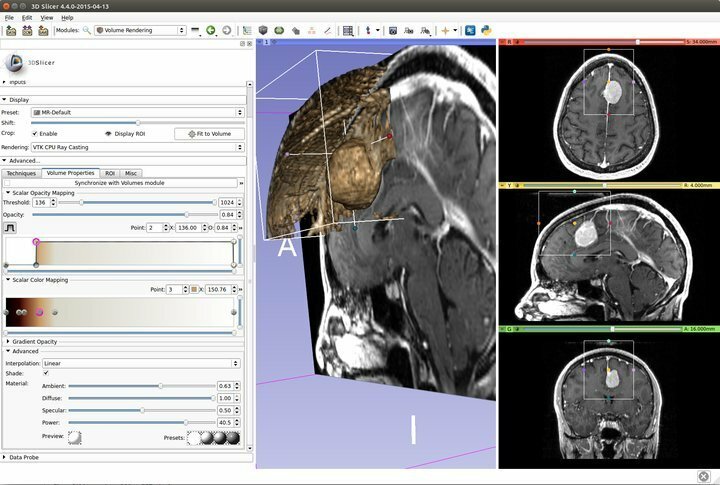 This medical imaging software for Linux is machine independent and works on the cloud entirely. It implements several layers of security measures to make sure sensitive healthcare data and user identities remain secure. The clients come with built-in synchronization ability. Sharing and managing files is more comfortable than most everyday Linux DICOM viewers. dcm2niix is one of my most favorite medical imaging software for Linux that I use to convert complex medical documents into NIfTI, widely used by much scientific software. This compelling tool is different than ordinary Linux DICOM viewers in the sense that it’s not intended for viewing DICOM files but to convert DICOMs into NIfTI. The opensource nature of the software ensures developers can modify the tool as they require. dcm2niix comes with out of the box support for raw, encoded, and regular JPEG lossless decoding. A modular handler called NanoJPEG is included in the package to handle lossy decodings. A flexible yet straightforward GUI interface named MRIcroGL is available for this DICOM conversion tool. Optional support for Gz compression is also available. DICOMscope is among those top-notch Linux DICOM viewers that makes viewing and analyzing such crucial medical documents into a child’s play. This modern0-day medical imaging software for Linux is maintained by the Debian Med Packaging Team and offers some of the most cutting-edge functionalities you can find. It is free for use and encourages opensource developers to extend it. It’s one of the most lightweight Linux DICOM Viewers according to our experts. DICOMscope can receive, process, and transmit large scale DICOM files over a DICOM network. A fully functional print server is packaged within the application to print DICOM files efficiently. Invesalius is a free yet compelling medical imaging software for Linux used in the reconstruction of human body parts images. It can generate 3D medical imaging from a set of 2D DICOM files which have been acquired from various medical equipment. Users can import their DICOM files quite quickly in this therapeutic tool and analyze them thoroughly. These files can be exported after processing into several different formats including STL, OBJ, and PLY. This is among the fastest Linux DICOM viewers and works well even in low-cost systems with hardware constraints. The image manipulation features work just right out of the box. Invesalius comes with built-in support for segmentation and region growing segmentation. Healthcare professionals often require medical documents into several different formats for many reasons. Medcon is a compelling yet straightforward medical image conversion tool for Linux that focuses solely on this matter. It’s unusual to your everyday Linux DICOM viewers and stands for Medical Image Conversion. The C-based application is blazing fast in execution and comes with several widely used features. This medical imaging software for Linux currently support Acr/Nema 2.0, Analyze (SPM), DICOM 3.0, InterFile 3.3 and PNG file formats. It offers an elegant GUI for better navigational experience for the user and a built-in command line utility for advanced users. The command line tool makes batch processing with Medcon easy. Orthanc is one of the best medical imaging software for Linux that allow conveniently creating powerful DICOM servers. This lightweight yet flexible DICOM server software provides a RESTful DICOM server that makes it possible to turn your computer into a mini PACs system. What this essentially means is you can collect your medical documents directly from several medical equipment and process or analyze them over the network. The software is very lightweight and doesn’t require any third-party dependencies. Orthanc can generate regular PNG files from DICOM files on the fly. The RESTful API enables developers to write extensions in almost any programming language of their liking. Trimage is a useful and flexible command line utility for optimizing images files efficiently. A handy GUI interface is also available to let new users explore this mesmerizing medical imaging software for Linux. Trimage compresses all of its images into a lossless manner and succeeds at its aim of delivering high-quality images in the lowest possible size. Users can take provide a range of inputs into Trimage to control their workflow. Trimage comes with built-in support for file dialog, drag and dropping. All images are converted without any loss by Trimage. Official binary is available for Debian, Ubuntu, and Arch Linux variants. 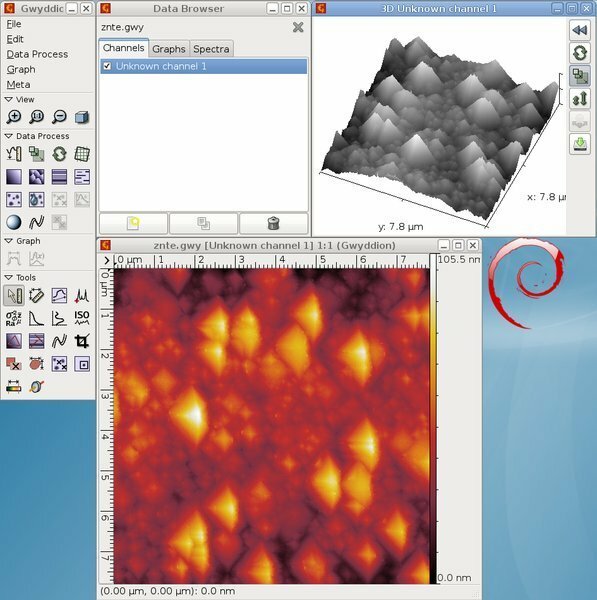 Gwyddion is an easy to use yet useful medical imaging software for Linux that makes analyzing and visualizing probe microscopy data a breeze. It supports a large number of microscopy data obtaining techniques including AFM, MFM, STM, and SNOM/NSOM. On top of that, its opensource license makes it possible to customize the software as required by professionals quite easily. The modular application can be extended using third-party developer plugins and custom modifications. The GUI interface is very interactive and lives up to modern-day requirements. From standard statistical characterization to leveling and data correction, Gwyddion offers plenty of functionalities into a small package. Since there’s an abundance of powerful medical imaging software for Linux, when choosing the best Linux DICOM viewers, you need to weigh your requirements above everything else. We also found image conversion tools to be helpful when it comes to analyzing medical data effectively. Hopefully, you’ve gained the essential insights you were looking for from this vast but informative guide. We’ll see you soon with more such modern-day guides and tutorials.